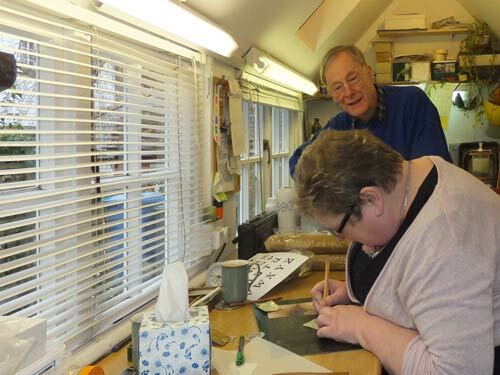 Lesley and I are spending more time at the drawing board and in the studio as we move from a period of booking Shows and ordering materials to the time of designing and making things for this year’s events. We have plenty of pewter for casting and we will be making several new moulds this month as we try to build up stock. Last month we were joined by Alison Harris from Brighton, shown here in our studio, as we provided a one-day course on “How to earn your living from your Craft”. She won our prize at the Worshipful Company of Pewterers’ “Pewter Live” event last summer by her obvious design ability and technical skills, but she had no knowledge of the realities of the professional Craft world. Hopefully she is better prepared now and we will be watching her progress! As it is April we are wrestling with the accounts for the end of the financial year. It takes us away from the fun of working with pewter but, like the photography of new products, it is an essential part of the business. There are loads of new designs that we want to produce by casting and by the repousse technique using pewter sheet, but time also has to be found for designing and making commissioned pieces. These often introduce us to new ideas about using pewter as we create the bespoke items. One way or another, there will be little rest for us in April! 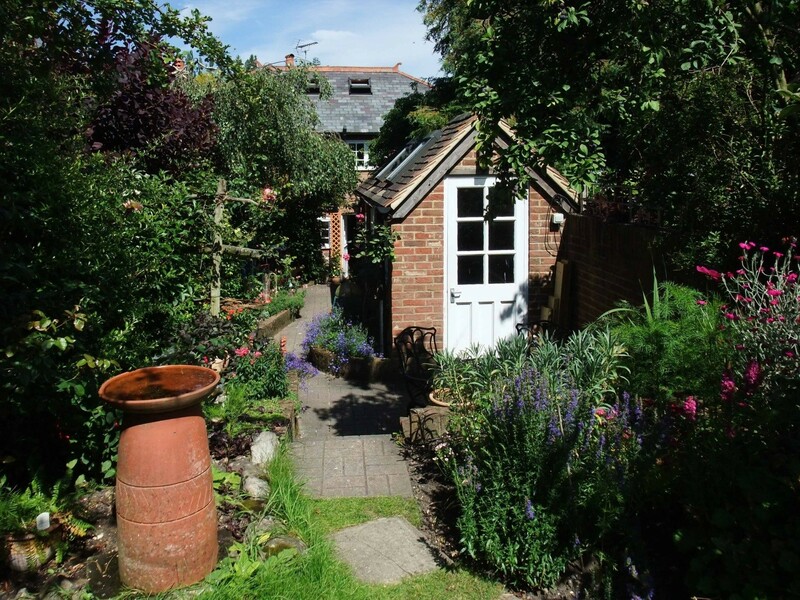 When you have been invited to enter someone’s house there is always the hope that you will be made to feel welcome and it is just as important with a website. 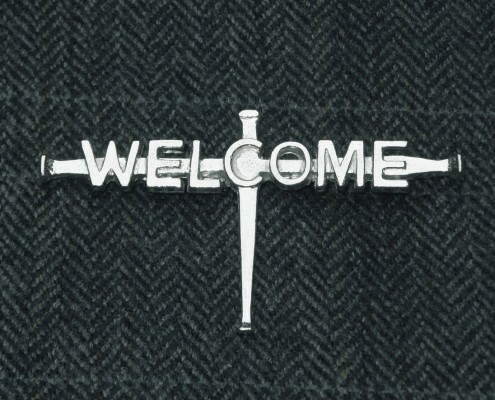 So, here is the “Welcome” sign, in pewter, of course! It was made for Holy Trinity Church in Cookham as one of six to be worn by stewards who greet people into the building on Sundays. The simple design shows a clearly visible bit of text in a suitable font, supported by a representation of the cross that is carried in front of the priests as they process during the Services. Being in modern pewter it looks good against any fabric whether plain or patterned. We always aim to evolve the design of a bespoke piece with the client so that it will be appropriate to the event that they wish to celebrate, ideally incorporating visual references as well as text. This aspect of partnership is important to us so that the customer feels the extra bit of involvement. Sometimes the commission is for a single piece but we are in a position to make limitless numbers of cast pewter items, usually for corporate clients or for social groupings. 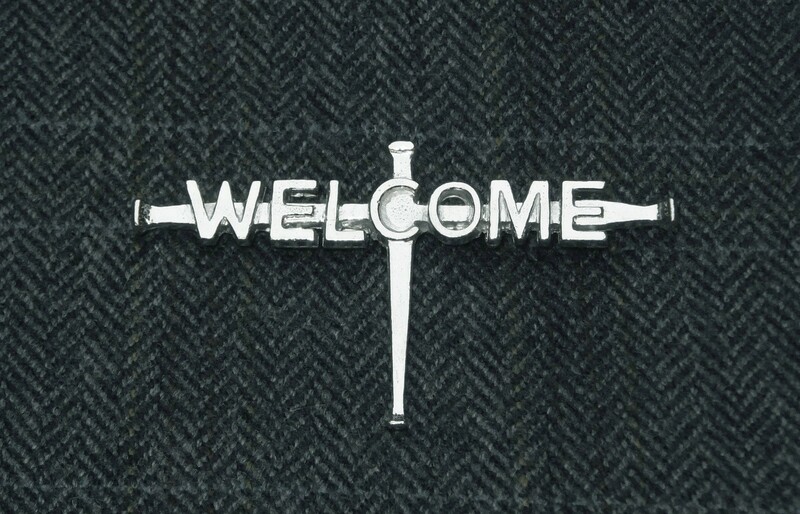 You can guarantee that if you meet us at one of the Craft Shows listed on our Events page you will be given a warm welcome at our stand, even though we will not be wearing an actual “Welcome” badge!